Love is in the air this week at Eat’n Park! 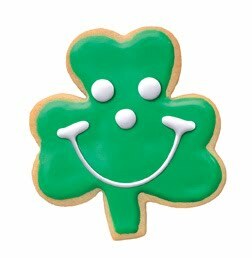 Stop in for a sweet treat for you (a free Valentine Smiley Cookie! ), and pick up some goodies for your special someone as well. Or, if you can’t be with your loved ones on Valentine’s Day, send them a smile from our online store! Read on to feel the love…. Valid through Tuesday, February 14, 2012. You heard right: Valentine Smiley Cookies are on sale, this week only! You can pick up a dozen for only $6.99! Or, if you prefer our mini Smiley Cookies, you can get them in Valentine’s colors for just $5.99 this week. Take some to the office, the school party, or home for a snack. If you have a soft spot for chocolate (don’t we all? ), you’ll definitely want to check out our Sarris Milk Chocolate Smiley Hearts - only $1 each! They’re available plain or with toffee pieces, and both varieties are delicious! Nobody does chocolate better than Sarris. Our online store at SmileyCookie.com has lots of great Valentine’s gifts to send to loved ones from afar. Send cookies, chocolate, or both with one of our special gift baskets! And, take 10% off your order using code ENP10, now through February 29, 2012. Excludes gift cards. Finally, if you forgot about Valentine's Day until just now, all is not lost. Our Valentine's e-gift cards are the perfect last-minute gift. Purchase one, customize it with a message or even a photo of you and your sweetie, and it'll be in your inbox within minutes. Print it out for a fast and easy gift! Breakfast at Eat’n Park: Start your day with a smile! Breakfast is the most important meal of the day. It can also be the tastiest! At Eat’n Park, we’re talking fresh-cracked eggs, premium coffee, and meals made to please – including two new breakfast items that will put a little pep in your step in the early morning hours! Our new Breakfast Burrito is going to rock your world. Scrambled eggs, chopped bacon, ham, and chorizo sausage, all stuffed into a tortilla with caramelized onions, Pepper Jack cheese, and chipotle sauce. Served with salsa on the side, and breakfast potatoes of your choice for $6.99. It’s everything you could want in a breakfast! Omelette lovers, this next one is going to melt your heart. Our three-cheese omelette is served up with Swiss, mozzarella, and cheddar cheeses. Because really, why have one cheese when you can have three? This cheesy goodness is served up with your choice of breakfast potatoes and toast for $6.99. And don’t forget about guest favorites like our Bananas Foster French Toast, Eggs Benedict, or Grilled Stickies Smile. When you’re craving something that you just can’t get at home, this is the ticket. Sure beats a bowl of cold cereal! Yes, we have fantastic coffee. You probably knew that. But do you know WHY our coffee is so good? Well, it’s probably because we travelled the world to find the best beans, then worked with talented local roasters to put together a custom blend. Our coffee comes from Costa Rica and Guatemala, where it is shade-grown at high altitudes – the optimal conditions for growing high-quality coffee beans. We work directly with the grower to ensure that our coffee is of the finest quality; we even visit the coffee plantation every few years to see firsthand the care that goes into creating our beans. 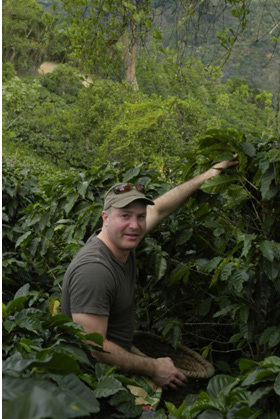 Click here to find out more about our last visit to Costa Rica from Jamie Moore, our sustainability expert. Our own Jamie Moore, picking coffee beans in Costa Rica. We also handcraft made-to-order lattes and espresso, whatever your fancy. Whether you like your morning caffeine hot, iced, frozen, or in a milkshake, we’ve got it. One of the best things about our breakfast menu (and ALL of our menus) is that we’ll make it your way. Hold the cheese, substitute the bread, swap out the veggies….mix it up the way you want it! We’re happy to customize your order for you, because everything’s made from scratch. Trying to eat healthier? Our turkey sausage can be substituted for any breakfast meat. Love your morning blueberry flapjacks? Ask us to make them whole grain. On a gluten-free diet? Get your breakfast sandwich on one of our gluten-free rolls. Just ask! So, start your day with a smile – we’ve got breakfast covered! Watching the big game on Sunday? Let us help take a load off - get your game-day feast at Eat'n Park! Use the coupons below to take $2 off a quart of soup to go (don't forget, Sunday is Potato Soup day! ), or get 20% off your takeout order. Coupons are valid only on Sunday, February 5, 2012.